Thomas Adès, when did you first encounter Buñuel’s film El ángel exterminador, and how long have you been playing with the idea of using it as the basis for an opera? Thomas Adès: The idea goes back at least fifteen years, to a time before I began to compose The Tempest. I saw the film when I was thirteen or fourteen, when I think there was a Buñuel season on the BBC. My mother is a historian of art, especially Surrealist art, with Dalì and Buñuel particularly being part of her work, and so I encountered these things early on. I was strongly attracted to Buñuel’s films. Possibly at that age I didn’t like El ángel exterminador – shot in black and white and rather dry – as much as the more colourful, more ‘Pythonesque’ ones, like Le Charme discret de la bourgeoisie or Le Fantôme de la liberté (still probably my favourite), but the film stayed with me to the point of obsession. When these ideas to write an opera come to me, it’s not so much a conscious thing – the process is more like a seed that gets dispersed in the wind and either lands where it can grow or doesn’t; a sort of germination process. But at some point you must have said to yourself: this film could make a good opera. Where does its potential for this lie? What makes it so suited to being translated into the medium of music or musical theatre? Thomas Adès: In a way, El ángel exterminador is an operatic story in a very pure form, because every opera is about getting out of a particular situation. But in Buñuel’s film, whatever the mechanism is that gets us from A to B, it’s switched off: the guests know that they should go home – they have children who are waiting for them, things to do, etc. – but they don’t go. Even when they are starving and in despair, they’re incapable of doing so, although the doors are open. When you’re writing an opera, the composer’s job is to write music that gets you from moment A to moment B to moment C – as it were from one room into another room into another, eventually arriving at a destination. Every piece of music is looking for an exit, and the fun thing in this opera is that the characters are looking for an exit the whole time but keep coming back into the same room, though right at the end they do find it, at least temporarily. The film is very musical in another way, too, because there’s an underground river of meaning which is not exactly what the people are saying. This river links the spoken lines and runs through the entire situation, but only occasionally surfaces. So the film has an unspoken subtext all the way through. Tom Cairns: As is the case with all Buñuel’s later films, El ángel exterminador does not have a film score. The silences between the spoken lines, scenes and situations lend themselves perfectly for music. Silence is a wonderful thing, obviously, but music can perhaps convey this underground river even better. Did your work on The Exterminating Angel begin with musical ideas – also as far as the overall structure of the work is concerned – or did you initially devote yourself solely to the libretto? Thomas Adès: The first steps are always very mysterious. At first one is dealing with individual notes, or two notes. It’s rather like watching an embryo develop, the difference being that you might understand the DNA of this tiny cell later on and see how it relates to everything else. Rather the larger structure eventually develops from trying to link these cells together. My image of music as a natural process, as a living, growing organism, is a fairly precise analogy of an opera and the way in which it is created. It wouldn’t be truthful to start at the beginning by sketching this enormous shape, especially for a piece like this where the movements of this underground river are so complicated from line to line. Tom Cairns and I worked for years on the libretto, and it went through at least six different drafts before a note of music was written. You need to have a strong sense of the overall architecture in order to find the specific character of the music. Tom Cairns: We’ve been working on the libretto since 2009. It was about deciding at the outset what the opera could be as an entity in itself. We agreed fairly quickly on what we could do to reshape the film and turn it into this particular art form. The libretto went back and forth several times, and in fact it ended up becoming much closer to the film than I’d imagined. In order to get the piece into a shape that was feasible on stage, we had to amalgamate a few characters – the seventeen guests of the Nobiles in the film become twelve in the opera. Since sung words take more time than spoken words, some of the text had to be reduced. Other original scenes were added. Thomas Adès: Once I started writing the music, this in turn inevitably demanded numerous changes. While you were working on the libretto, were you already considering where you would make use of the specific possibilities that musical theatre offers – particularly ensembles? For example, did you plan right from the beginning to make an ‘Enchanted’ ensemble out of the scene where the guests are being introduced to one another? Thomas Adès: No, these decisions were taken as I was composing, for example, when I noticed that a line spoken by one person is actually a communal utterance. In the case of the guests being introduced to one another I suddenly saw an opportunity given by the Spanish word ‘encantado’: for an English-speaking person it is of course slightly odd to say ‘enchanted’, but thanks to its double meaning – ‘pleased to meet you’ and ‘spellbound’ – the word underlines that the figures are under a sort of spell and that the story has something of a fairytale. Tom Cairns: Later, towards the end of Act Two, we refer to it again, when the Doctor passionately cries out: ‘We are not “enchanted”. This is not a magician’s house!’ He’s desperate to bring the mysterious situation under control and pull it back into his medical-rational approach to life. He is desperate at that point and in the most dreadful emotional state because he can’t control the situation. Scientific analysis is useless. Thomas Adès, you have made various passages in the libretto into small solo scenes or mini-arias that show the figures – their character or emotions – in a different light from the film. During their captivity in the drawing room the guests are transformed from elegant, cultured people into something close to barbarians. While Buñuel depicts this process from a distanced, almost documentary perspective, it’s especially in these solo passages that you take us up close to the characters, sometimes in a very moving way. For example, we encounter the rather decadent Silvia de Ávila in Act Three cradling a sheep’s cadaver in her arms while she sings a ‘Berceuse macabre’, believing she is rocking her little son Yoli to sleep. 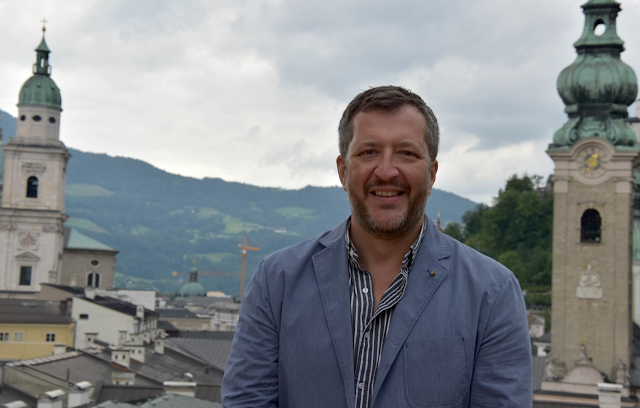 Thomas Adès: I think music demands these moments in opera – moments where things don’t proceed in ‘real time’, but where the action stops and the music comments on the emotional meaning of what is happening. In order to give some of the characters these static moments we’ve also made use of poems by Buñuel from the late 1920s, that is, from his very early, Surrealist phase. Buñuel puts the people into a situation where their personalities as they are when they first encounter one another eventually break down or turn into something else. Buñuel plays with this façade. In the opera, the music supports the private personality behind the façade on the one hand (and lets us feel empathy with the characters), but on the other it also supports the other force which is pulling them into a kind of shared nothingness. Music can be powerfully levelling, because it tends to want to resolve everyone into the same place. The whole process is heightened in the opera. The music is a sort of destiny the characters are subject to. Sometimes it feels as if the music is responsible for keeping them in the room, and in the end it’s the music which releases them. Often the music knows more than the people. When for example the guests arrive at the mansion and then – a physical impossibility – arrive again through the same door, we hear the same music but in altered form: it contains more sinister undertones, conveying a slight sense of things not happening quite at the right time or in the right order. When the guests have walked into the house the music occurs again in the orchestra, and this time you can sense that they are leaving reality behind, perhaps even that reality itself dissolves behind them. Is the phenomenon of disintegration that the guests experience outwardly and inwardly reflected in your score? Thomas Adès: …something I find very moving. The music that you associate with the world of elegant social ritual, here and at the beginning of the opera, is the Viennese waltz, often coupled with lush chromatic harmonies. Thomas Adès: What interests me about the waltz is the seductiveness of this music. I often feel that the waltzes by Johann Strauss are saying: ‘Why don’t you stay a little longer? Don’t worry about what’s going on outside.’ So in the context of our opera the waltz becomes very dangerous… When panic breaks out among the guests in Act Two, I have layered motifs derived and distorted from various Strauss waltzes over one another in a Fugue of Panic, transforming them into a kind of whirlpool. Against that you have Leticia, whose music is mostly from another world. Her music takes over at the end and releases the guests from their strange captivity. This takes us back to the irrational basic situation of the plot: the inability to leave the drawing room although there are no visible obstacles. In a brief text written by Buñuel to precede the film when El ángel exterminador was first shown in Paris he stated that ‘perhaps the best explanation’ for the film was that ‘rationally there is none’, but conceded that the film was open to multiple interpretations. Tom Cairns: I’ve come to think very much like Buñuel, which I suppose is inevitable. I don’t feel the need to rationalize the situation. It feels almost normal to me that the guests can’t get out. I now don’t see it as irrational. Thomas Adès: For me, the question is actually: Why can anyone ever leave a room? Why is it Leticia who realizes how or rather that she and the others can leave the room? Thomas Adès: The fact is that the servants, by some kind of instinct, know before everyone else that they have to leave the house. The host and some of the guests are aristocrats, but there are many hints that Leticia originates from a world closer to that of the staff – not least her higher sensitivity to what is happening to them. Tom Cairns: Leticia is somehow aware of the situation long before the other guests. That’s possibly why she hurls the ashtray through the window in Act One – a first instinctive attempt to let air in from outside as she feels a strange atmosphere encroach on the room. Thomas Adès: There is the idea that the humbler their origin, the more understanding a character will have of the power of the exterminating angel. This may be why Eduardo and his fiancée Beatriz – who don’t appear to be particularly privileged – choose to taken their own lives rather than become victims of the exterminating angel. But who or what is the exterminating angel of the title? The film was originally going to be called something else and wasn’t renamed until during or after the shooting. Buñuel later said that he had sensed a ‘subterranean connection’ between the title El ángel exterminador and the content of his film. Thomas Adès: In a way, the exterminating angel is an absence – an absence of will, of purpose, of action. Why do we ever do anything? The film poses this question in a very pure form, and the answer is: because otherwise we would be at the end, with death and extermination. You could say that extermination is what we’re fleeing from when we leave a room, when we do anything at all. In a way, the opera throws me back on how miraculous it is that we can and must act, indeed that we are alive at all. (In fact I find conducting it is surprisingly exhilarating – I’m starting to think of it as ‘The Exhilarating Angel’.) In this story the force that makes us act has been turned off, like a switch. The people no longer know why they should go home; they have forgotten what they are. The Doctor with his scientific, rational conception of the world tries in vain to control the phenomenon by giving it a pathological label – a Buñuel joke, diagnosing it as ‘aboulia’. On the one hand Buñuel conveys the impression that the force stopping the guests from leaving lies within themselves, but on the other, with this title, he takes the step of saying: let’s pretend that there is such a supernatural, destructive force, a mythical figure which makes it impossible to act. For me, once the exterminating angel has taken possession of the guests, the only possible outcome is the complete breakdown of society and the imposition of martial law – and ultimately the end of the world. In the interlude after Act One you convey this dimension of the events in the drawing room in a very disturbing way. The music recalls the unsettling concluding sequence of Buñuel’s film, where demonstrators or revolutionaries are gunned down by the police. Thomas Adès: Yes, it’s the first hint of that in the opera. Incidentally, Buñuel was obsessed by the drums of Calanda – his home town, where during Holy Week they would drum for three days and three nights – and I had thought for years about putting them in the opera, until I suddenly realized that the very judgemental interlude after Act One has the same rhythmic structure as the – unusually long – drumming rhythm in Calanda. So the drums naturally went in, which immediately brought the military quality I was looking for. Thomas Adès: It’s the first time I’ve ever used an electronic instrument in a piece: for me, the Ondes Martenot has the same relationship with the acoustic instruments of the orchestra as the exterminated world without life has with the world that does have life, without the exterminating angel. The Ondes Martenot becomes a symbol, the voice of this exterminating angel in the sense that the instrument is heard whenever a figure says something that contributes to the situation of immobility. Sometimes the Ondes Martenot almost forces things, for example, when the people outside are trying to make the little boy Yoli go into the house: the Ondes Martenot intervenes and it’s as though it frightens him into running away. The bells with which the piece starts and which also sound at the end function as a sort of herald for the exterminating angel. You could say that bells are a kind of music which stays in the same moment all the time. Buñuel often used bells in his films, and especially here in Salzburg I’m struck increasingly by their extraordinary nature: they’ve been ringing for centuries, rang long before we were here and will ring long after we’ve gone. Bells are a form of eternity appearing in the river of time, an expression of the unchanging. They are saying: here is this moment again, and again, and again, and it is still the same, and so are you. Let us return to the person who frees the guests from their state of paralysis: in the opera Leticia is given an even more central role than she has in the film. You’ve made her the prima donna of the opera performance the guests have been attending, whereas in Buñuel’s film the singer is a different figure, and after the dinner, in the drawing room, the guests plead with Leticia in vain to sing for them. Not until the end of the opera, when Leticia entreats the others to repeat their utterances and actions of the first evening, does she actually sing, and it’s as if her aria releases the guests from the room. Thomas Adès: There is an idea that is present in the film but very easy to miss as it is not underlined by Buñuel – the character of Leticia, the ‘Valkyrie’, who almost never speaks, does not say ‘I want to go home’ at the crucial moment at the end of the first evening, as though she has forgotten her line; and it is almost as though this condemns them all to be trapped. I saw an opportunity to link this to the operatic soprano character whom we fused with Leticia, and have the missed line actually be a whole aria. Where did you take the words for this aria from? Thomas Adès: I have amplified a Jewish aspect here that is referred to only glancingly in the film – in an anti-Semitic line spoken by Raúl when the ashtray flies through the window (and which we have removed): ‘Some Jew passing by.’ The text of Leticia’s aria at the end of the opera is taken from an early twelfth-century Zionide of Yehuda Halevi, who wrote of his longing for Jerusalem in Spain. In the original it says ‘Zion, do you ask of my peace, who longs for yours?’, so I changed this to ‘My home, do you ask of my peace…’. Perhaps Leticia may have experienced this larger dimension of homesickness and exile. The return to Jerusalem is the ultimate image of returning. Buñuel also was very much an exile, which made him a figure of legendary power within Spain. There are also elements in Halevi’s text that link to the Surrealist imagery in El angel exterminador: the scattered sheep, the idea of eagles’ wings, the idea of ‘the chosen’. There’s also a subtext of Jewish exile in the figure of Blanca, who is a musician as well, and like Leticia does not belong to the aristocracy. Her aria is based on the children’s poem ‘Over the Sea’ by Chaim Bialik, the father of modern Hebrew literature, with a very similar subject to Halevi’s Zionide. And the variations that Blanca performs on the piano in Act One are of course not really by Paradisi but my own variations on the Ladino song ‘Lavaba la blanca niña’, which has an unassuageable harmonic structure very typical of Jewish music of longing and bereavement. And Leonora, with her obsession with the Kabbalah, completes our trio of ‘witches’. Long stretches of the music of Act Three have an obsessive and dissonant, if you like irrational, quality. Leticia’s aria comes as a release, also in musical terms. It’s striking that it contains not a single half-tone or tritone, intervals that have occurred very frequently up to this point. Thomas Adès: Actually, there are no dissonances in Leticia’s aria at all, at least not if you look at it from the perspective of a time so far back that it’s long before the rules of our traditional harmonics were established. I wanted this aria to have something of the quality of music from the twelfth or thirteenth century, because it can sound as strange to us as music that is very dissonant. At the end of the opera, the bells – which you described as staying in the same moment all the time – ring, here in combination with a repetitive musical form that constantly returns to the beginning, one which you’ve used several times in your works: the chaconne. To a line from the text of the Requiem the chorus repeatedly sings the same seven bars that it has already sung in the large ensemble before Leticia effects their release – the scene in which the guests take the decision to kill Nobile, their host, as a sacrifice, and which has a lot in common with the ‘delirious’ second dream sequence in the film. Thomas Adès: Obviously, depending on how it’s written, a chaconne can have the quality of constantly not going through a door. When the chorus begins to sing that line from the Requiem off-stage, I want to convey the feeling that it’s been singing it forever and that it will go on forever after. That’s why this music returns at the end of the opera in a heightened form. With this chaconne – as opposed to the chaconne in The Tempest – my idea was that it never ends; that it just goes round in a spiral, down and down. My opera starts without a clear beginning – the bells one hears could just be the bells from outside (especially here in Salzburg) following one into the auditorium – and it has no real end. The score does not end with a double bar. Buñuel’s film also has an open ending; it’s in the nature of the story. The final scene of the opera, however, differs from the film in several respects. Tom Cairns: The final scene of the film takes place in the cathedral. The idea is that the guests have returned to the bourgeois or aristocratic world they had left – they’re back in their elegant clothes, they’re duly humbled, and of course they have to give thanks for their release – and then everything starts again from the beginning. For me, personally, this repetition is the least important part of the end. It’s the bigger issue that really matters: that there is no escape. We felt that this could be delivered within the context of our piece just as well without relocating the last scene, perhaps even more effectively. Ultimately we – that is, the audience in an opera house – are not that far removed from the people we’re watching on stage in The Exterminating Angel, very close in some cases; so why not ‘release’ the guests straight into the theatre, into the auditorium? At that moment they become other characters in a wider dramatis personae which now includes the members of the audience. Thomas Adès: The feeling that the door is open but we don’t go through it is with us all the time. At the mansion of Edmundo and Lucía de Nobile guests are expected for dinner, but strange things are happening. The butler, Julio, fails to stop Lucas the footman from running away, and the maids Meni and Camilla also attempt to leave. The Nobiles arrive after attending a performance at the opera. Among their guests are the evening’s prima donna, Leticia Maynar, and the conductor, Alberto Roc, with his wife Blanca, a famous pianist. Meni and Camila finally escape along with some other servants when the guests go into the dining room. At dinner, Nobile toasts Leticia, whom brother and sister Silvia and Francisco de Ávila jokingly call ‘the Valkyrie’. Lucía announces a first course of Maltese Ragout, which the waiter spills spectacularly on the floor. Not everyone finds this funny, least of all the elderly Señor Russell. Lucía decides to postpone her other ‘entertainments’, and a performing bear and a number of lambs are removed to the garden. The rest of the servants flee the house despite Lucía’s protestations. Only Julio remains behind. In the drawing room Blanca performs a piece on the piano. A young engaged couple, Eduardo and Beatriz, dance, and Leonora flirts with her physician, Doctor Conde. When he declines to dance, she kisses him instead. The Doctor confides in Raúl Yebenes that Leonora is gravely ill and does not have long to live. Blanca’s performance ends to general acclaim and compliments. The guests encourage Leticia to sing, but Señor Roc protests that she has performed enough for the evening. A number of guests prepare to depart, while Roc falls asleep. In the cloakroom Lucía gives her secret lover, Colonel Álvaro Gómez, a fleeting kiss. The guests become lethargic and distracted – although it is now very late, none of them attempt to leave. Nobile is confused but behaves graciously, offering beds to anyone who wishes to stay. Señor Russell and the Colonel are horrified as some guests remove their tailcoats, but eventually they lie down like everyone else to sleep either on sofas or the floor. Eduardo and Beatriz retreat to a private corner to spend their first night together. The guests wake the following morning. Silvia announces that she slept very badly. The Doctor examines Russell: the old man is dying. Julio is supposed to prepare breakfast but reports that no supplies have arrived at the house. When Lucía tries to take some of the ladies to her bedroom to freshen up, they do not make it past the threshold of the dining room. Blanca is worried about her children, but even she and her husband are unable to make the decision to leave. Silvia finds the unusual situation amusing, particularly as she knows her son is in good hands with his private tutor, Padre Sansón. A further attempt by the guests to leave fails when Julio approaches with coffee and the leftovers from the previous evening’s dinner. Leticia entreats the butler not to enter the drawing room, but in vain. Blanca is desperate, while Raúl sees no reason to over-dramatize the situation. Francisco complains he cannot possibly stir his coffee with a teaspoon. When sent to procure coffee spoons, Julio also seems to have become a prisoner in the drawing room. Evening approaches. Russell’s condition has worsened: he has fallen into a coma and needs urgent medical attention. Panic spreads among the guests: there is nothing more to drink, the outside world seems to have forgotten about them – and why did the servants leave the mansion the night before for no obvious reason? The Doctor pleads for calm, although even he seems to be losing his composure. Raúl becomes aggressive and holds Nobile responsible for the situation. Francisco is at the end of his tether and resists all attempts at pacification. Russell suddenly and unexpectedly regains consciousness, expressing his relief that he will not live to experience the ‘extermination’. Beatriz is troubled by the thought of dying amidst all these people, rather than alone with Eduardo. Blanca, Silvia and Leticia share a strange experience in the walk-in cabinet, which has been repurposed as a toilet. During the night Russell dies. The Doctor and the Colonel haul his corpse into the cabinet, witnessed by Eduardo and Beatriz. Police guarding the mansion drive back a crowd of people who try to come to the aid of those imprisoned inside. Although some people break through the police ranks, nobody is able to enter the house. In the drawing room Julio and Raúl burst a water pipe and the guests rush desperately to quench their thirst. Tormented with hunger, everyone’s behaviour becomes increasingly irrational. Blanca combs only one side of her hair, driving Francisco to hysterical desperation. When Francisco is unable to find the pills for his stomach ulcer, he immediately presumes that someone has hidden the box. Raúl goads Francisco about his relationship with his sister and triggers a volley of insults between the two men. Nobile tries to keep the peace, but this merely earns him recriminations. Leonora, who is in great pain, expresses her longing for the assistance of the Doctor and the Virgin Mary. Francisco is nauseated by Blanca’s smell and once again loses his nerves. In her delirium Leonora sees a disembodied hand wandering around the drawing room. Trying to stop it, she stabs Blanca’s hand with a dagger. In the walk-in cabinet, Eduardo and Beatriz decide to die together. Señor Roc appears to molest Leticia, but Raúl accuses the Colonel instead. Nobile is injured during the ensuing scuffle. The lambs from the garden wander into the drawing room and the roaring of the bear terrifies the guests. The army has quarantined the mansion. Padre Sansón appears with Silvia’s son, Yoli, and the people demand that the boy be sent inside. Despite encouragement from the crowd, Yoli is unable to get into the house. The guests have slaughtered the lambs and cook them on a makeshift fire. Leonora recalls a premonition she had on the evening of the opera performance and attempts a magic ritual with Blanca and Leticia. It fails and she claims that innocent blood is needed. The bodies of Eduardo and Beatriz are discovered in the walk-in cabinet. During the course of yet another quarrel, Raúl hurls Francisco’s box of pills over the threshold of the drawing room. Silvia no longer takes any interest; cradling the cadaver of one of the lambs in her arms, she thinks she is rocking Yoli to sleep. The bear appears across the threshold. Gradually the idea takes hold among the guests that a sacrifice is needed to secure their liberation: Nobile must be killed. The Doctor and the Colonel try in vain to make the others reconsider. Nobile declares that he will sacrifice himself of his own free will, but Leticia interrupts him. She says she has realized that at this moment each one of them is in exactly the same place as when their strange captivity began. With her encouragement the others hesitantly repeat the actions and dialogues from that moment. When Leticia is then asked to sing once again, this time she actually does so. Together they approach the threshold – and they are able to cross it. The guests and the crowd outside the mansion encounter one another. Their freedom will not last long.